•	Teaches reading and writing in one course to help students read from a writer's viewpoint and write with a reader in mind. •	Engages students in real-world, college-level projects to gain the literacy skills they needed to succeed. 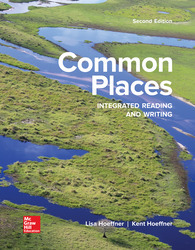 •	Provides a cohesive instructional framework to accelerate college readiness through author-created resources and Connect Integrated Reading and Writing.